For faster speed (up to 95 MB/s*), shoot with the SanDisk Extreme® Pro SDHC and SDXC for 64GB UHS-I memory cards. Compromise nothing with SanDisk Extreme Pro SDHC and SDXC UHS-I memory cards. Experience RAW + JPEG continuous burst mode shooting and capture fast-action Full HD video like never before. 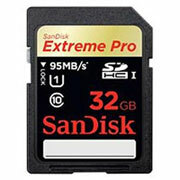 When every shot counts, choose SanDisk Extreme Pro SDHC/SDXC UHS-I memory cards for your DSLR or HD camcorder. Extreme Full HD video recording speed enabled by UHS Speed Class 1†† and Class 10 lets you capture fast-action video in Full HD, even in 3-D†.